American Girl Doll Central | It's Christmas at AGDC! First of all, let me say…. As you know, I haven’t posted for over 2 months, plus even then I was hardly posting. Well, it’s not as if I’ve not been online. I’ve been hopping on Picasa and have a bunch of new photostories, plus, AGDC has gained a new friend. 😉 LANIE! That’s right, for Christmas I got LANIE!!! But…I’ll get to that later. I know all you are probably super mad at me or really upset or whatever and I’m really sorry. I’ve also started my own blogger blog starring, well, me. And this AG blog was really feeling like a burden to me, and I don’t want to blog if it doesn’t make me happy to blog, you know? So I kinda just, stopped and just forgot about it for a while. My bestie came over just yesterday and kept telling me that people were emailing HER saying that they wanted me to come back. I’m not sure if this means I’m going to all the sudden starting coming on here and blogging every week like I used to. 1. All photostories are going on Picasa. I probably will make a page on here linking to all my picasa photostory albums, not to mention the ton I’ve added here. It is just way to hard to upload them to both, and it is so much easier on Picasa. 3. All of “my stuff” like Tween Girl’s Daybook, or random thoughts from myself, are all being moved to my new blog, which I will mention soon. I hope all of you understand! Talk to you soon! Hang in there! Haha my friend and I are so psyched right now!!!!! We are on the updated (or should I say Kanani-ied) AG site and it is AWESOME! We are actually acting pretty crazy singing “Oooka ooka ooka ooka booka ooka Kanani!” LOL. We’ve already sent 3 Kanani and Me ecards each! 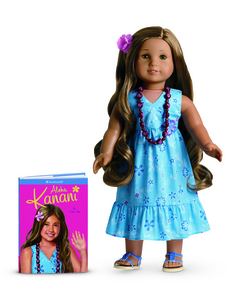 They are pretty awesome and did you know everytime you send one, you get an automatic chance to win a Kanani Doll and book? Abby and I were saying it would have been a good idea to have a Kanani sweepstakes and send a family to Hawaii. Oh well, winning a free doll is pretty awesome too. 😉 Here are some slides and pics from the site (NONE OF THE PICS BELONG TO US! ALL PICTURES BELONG TO AG! NO COPYRIGHT INTENDED)! 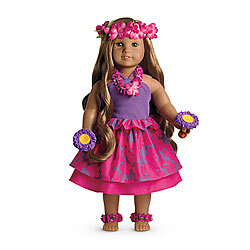 Kanani’s Luau Costume! LOVE IT! Kanani’s Beach Outfit, including her bathing suit, life jacket, and paddleboard set. Happy New Year of 2011!! !